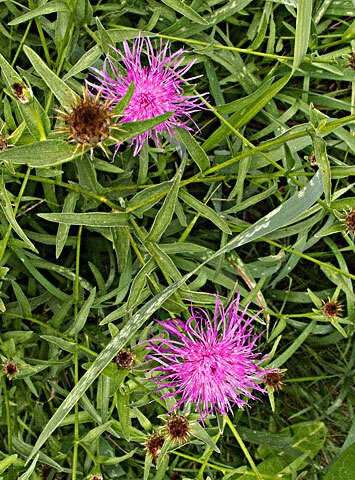 A perennial herb with erect, branched, glabrous or somewhat long-hairy stems that grows 1.3-3.2 ft. (0.4-1.0 m) tall. Stems are erect or ascending, openly branched distally, villous to scabrous with septate hairs and loosely tomentose. Leaves are basal and proximal cauline, petiolate, blades oblanceolate or elliptic, 2-10 in. (5-25 cm) long, margins entire or shallowly dentate to irregularly pinnately lobed; distal cauline sessile, not decurrent, blades linear to lanceolate, gradually smaller, entire or dentate. Flowers are radiant or discoid, in few-headed corymbiform arrays, borne on leafy-bracted peduncles. The involucres are 0.6-0.7 in. (15-18 mm), subcylindric to ovoid or campanulate, usually longer than wide, even when pressed. Flowering summer-fall (Jun-Oct). 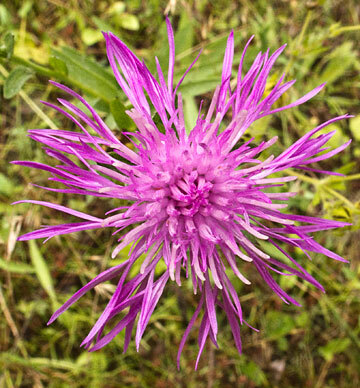 Centaurea nigrescens can be found in disturbed areas including along roadsides, fields, pastures, and waste areas. It is native to Asia and Europe.